It turns out, it could. It happens more often than you might think. Ice is Elsa’s life in the movie “Frozen”, but for the rest of us, too much of it is fatal. Icicles have been killing people for centuries, most of which are accidental in nature. Hence, it is important to remain vigilant at all times, especially when winter sets in. Has anyone died from an icicle? Falling icicles kill people all of the time — especially in Chicago and Russia. In fact, death by icicle goes back to at least 1776. Here are 10 chilling tales of people killed and injured by falling icicles, ice dams, and roof snow. It only takes one falling icicle or ice dam to do serious damage. Protect yourself and be aware! In the United States, about 15 people are killed by icicle-related accidents each year. Unfortunately, this number climbs to 100 in Russia. In 2001 alone, at least 74 Muscovites were struck by plummeting ice, one of which was an 18-year-old conscript. These numbers show how serious of a hazard ice is, warranting attention of citizens living in snow-yielding regions. Prevention is the strongest defense against ice-related deaths. While there’s no questioning of its alluring beauty, ice can take on many deadly forms. The most monstrous of them is an avalanche, the deadliest of which took place at Peru in 1970. Dislodged from the peak of Mount Huascarán, the gargantuan slump of ice rushed down in an approximate speed of 100 to 600 miles per hour, taking about 20,000 people lives. Ninety-two survived. Hikers and skiers are particularly prone to meet avalanches, and the easiest way to avoid one is to select a travel route away from a risk path. Sufficient knowledge about their nature – why they occur and how to deal with them – is of utmost importance. Staying updated on weather reports is also helpful, as hiking immediately after a storm is discouraged. Most avalanches occur after a heavy snowfall. Wind and trees can also be helpful in avoiding avalanches. A route that has generous winds will likely have thinner snow, reducing chances of massive ices. Trees, on the other hand, are indicators of a route which may not have a history of any avalanche, as opposed to areas with no trees at all. People also die by falling through ice. One sad story is that of a mother and son, who both died in an icy pond. According to the report, the child wandered onto the pond. His mother went to get him, but in an unfortunate turn of events, both fell through the frozen water. While the mother was able to pull her son out of the pond, she was stuck herself. Rescuers came at the site to retrieve the victims, but they were pronounced dead in the hospital. 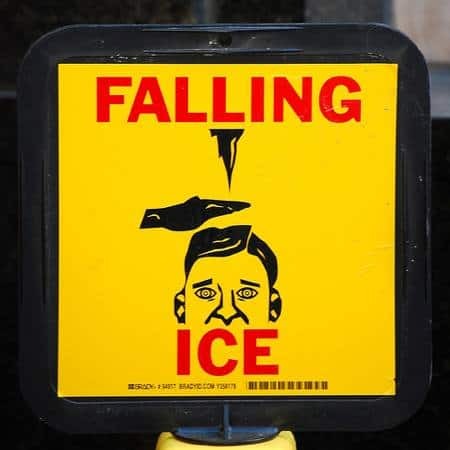 Preventing falls through ice is easy when one is quick to spot hazard signs. Cracks or flowing water are indicators of thin ice. Ice with a mixture of cloudy and clear areas must not be trusted. Unless it is really necessary, you must stay out of any suspicious ice that formed in a body of water; otherwise, equip yourself with safety gear such as shoe spikes, ice picks, screwdrivers, flotation devices and communication paraphernalia. Yet death by a falling icicle is perhaps the freakiest incident of all, simply because odds seem to go against one’s favor. Dying this way means the victim has been in the wrong place at the wrong time. It is a situation where external help can do little, especially when it happens in the blink of an eye. How does one evade death in this manner? A reasonable prevention is to stay indoors at wintertime. Dr. Mark Cichon, chair of emergency medicine at Loyola University Medical Center in Maywood, Illinois, explained that an icicle is a very sharp dagger and combined with forceful dynamics of impact, it can really lead to a serious injury or even death. Cichon encouraged being mindful of ice above the head and below the feet when walking outside. It also makes sense to take shelter, as soon as possible, when small pieces of ice start falling from the sky. Falling icicles are undoubtedly painful at first impact. They become more dangerous as they grow in size and increase in distance from the ground. It takes some physics to understand precise effects, but noticing risks is more essential to prevent any injury. Icicles likely fall during windy or sunny weather conditions, and they can come from buildings, skyscrapers and towers, among other locations. Very strong winds tend to thin the anchor of ice to its attachment, which can lead to detachment and a bizarre fall affected by gravity and aerial direction. A sunny weather that follows a snowy day must not be trusted as well, because ice from virtually anywhere will be fragile. Pedestrians below high-rise areas are particularly at risk to become victims of falling icicles, so it is not uncommon to see warning signs set up by authorities. Because icicles can fall from buildings, it is important to keep an eye on structures that appear to have much ice beneath them. In 2014, streets around New York’s 1 World Trade Center were closed when ice was spotted forming along the 1,776-foot structure. Energy-efficient, high-rise constructions are actually seen problematic by some architects, as they are noted to keep more heat inside, permitting the outside to get colder. As a result, ice builds up much faster. Without a doubt, ice falling from skyscrapers pose serious threats to urban pedestrians. Because it is the natural product of winter, there’s really no one-way solution but to devise ways of neutralizing, minimizing and avoiding its impact. The son of a Parish clerk in Devonshire, England, was killed when an icicle fell on him and fractured his skull. In 1903, a police officer in Cassopolis, Michigan was killed when a “huge icicle which fell upon him… and cut off the top of his head.” Ouch. A 48-year-old pastor, also in Michigan, was clearing icicles from his roof and loosened an icedam, which fell on him and killed him. A “microwave-size” chunk of ice fell off of a Neiman Marcus building in Chicago, killing Donald Booth of Wisconsin. The department store settled with his family for $4.5 million. In 2008, at least 5 people were killed by falling icicles in the industrial city of Samara, Russia. A woman walking down Prospekt Yuriya Gagarina in St. Petersburg was struck by a falling icicle. She died on the spot. An icicle hit a 7-year-old boy in the head while he was playing outside. He “suffered traumatic brain injuries,” but survived. At one Chicago hospital, at least 8 people were treated for falling ice-related injuries in 2000. Proving that wintertime weapons need not be sharp and pointy, a 55-year-old woman in Stockholm, Sweden’s vertebrae were crushed by snow that fell off of a roof this year. So if you live in a cold climate, especially one in Russia or the Midwestern United States. Beware of roof overhangs with seemingly innocuous icicles, especially in busy downtown areas. While it sounds like something out of a movie or a book, injury or death by icicle is possible and relatively common. Sadly, people killed by icicles happens around the world. the headline should read 7 stories of people dieing by icicles, and three maiming stories. By my count, 11 people died in the above stories. Thanks for reading! That’s crazy! Imagine if someone wielded an icicle weapon! The evidence would melt! However would the police solve the murder? He’s being nitpicky, but you are being evasive and stubborn by no t admitting he is technically right. Your title mentions 10 *tales*of people who died. There are only 7. True! Hopefully it’s a good read, anyway. It was a good read. Don’t let stupid people being nitpicky ruin your day!